Apple really wants us to believe a tablet can take the place of a MacBook, and it’s spared few resources in its quest to proselytize us with the 2018 iPad Pro. The iPad Pro a beast, one that can hold its own alongside powerful laptops. It’s a stunner, especially with a redesigned Apple Pencil and Smart Folio Keyboard that feel more like essentials than peripherals. It’s versatile, thanks to the new support for USB-C, and it achieves all this while looking both familiar and futuristic. Oh, how I’ve waited for it. I’m one of the loons who willingly used an iPad Pro as my primary writing machine for almost two years, and I loved its portability and the ease of switching between typing and longhand writing. Yet for all that, switching back to a MacBook felt like getting new glasses after months of living with a faulty prescription. Little frustrations vanished. Formerly complex tasks became simple. My productivity skyrocketed. Never again, I figured, would I ever reach for the iPad Pro for work. But the 2018 iPad Pro makes a compelling case with all that power, all that potential. I’ve been using it as my main work device, and at times I’m in awe of what it can do. At other times, though, I find myself wondering why Apple hasn’t taken better advantage of all that fancy hardware. Too often, I found myself thwarted with the same complications that led me away from the iPad Pro in the first place. There’s never been a better tablet. Regardless of what Apple wants you to believe, though, there are still plenty of better laptops. The iPad Pro certainly looks like it means business. After so many years of the same basic iPad design, Apple has treated us with sleek, flat, angular edges that were partly designed to wirelessly charge the new Apple Pencil, but also make it easier to hold. Curves still assert themselves in the device’s corners (and, beautifully, on the edges of the display), but they’re subtle. Indeed, if anything, it looks a lot like a massive iPhone 5s—and that’s not an insult. Still, the changes stand out. 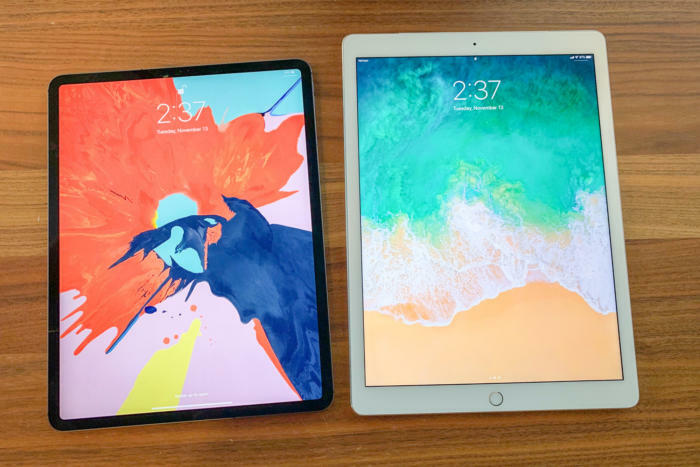 No one will mistake the 2018 iPad Pro for anything but an iPad, but I was astonished by how many people in public immediately recognized it as the new iPad. That's due to the display. The 2732x2049 Liquid Retina LCD display with 264ppi isn’t terribly different from what we saw in the iPad Pro last year, and it’s packed with all the goodies like TrueTone color adjustment and ProMotion refresh technology that we’ve come to expect from the Pro line. I admire the color range you get from its DCI P3 specifications, but its 600 nits of brightness still don’t match the more than 700 you’ll get on the iPhone X and newer devices. The display is about the only thing you see when viewing the device from afar. Apple likes to say the display spans “edge to edge” in its marketing, but you’ll find a roughly half-inch black bezel encircling the screen that helps hide the 7MP TrueDepth camera for Face ID without adding a notch. Some apps like Spotify still haven’t adjusted to the new aspect ratio on the smaller 11-inch model. The display dominates all impressions, partly because Apple scrapped the device’s “forehead” and “chin,” thereby shearing off an inch while keeping the full 12.9-inch display. In the process, the iPad as a whole better mimics the feel of an 8.5-inch by 11-inch piece of paper. It feels more comfortable holding it while reading on the couch. It minimizes the differences between the two models, as many people had trouble figuring out if I was using the 11-inch model or the 12.9-inch model (and there would have been no question with previous designs.) I’d call it perfect if the otherwise improved anti-glare coating weren’t so ridiculously prone to smudges, to the point that I wondered if that messiness was the main reason why we’ve yet to see touchscreens in the MacBook line. No, the bezels aren’t entirely gone, but man, what a difference. The storage options alone emphasize that Apple wants us to see this as a “pro” device that’s capable of handling what artists and photographers will need when full Adobe Photoshop lands on the platform next year. Along with 6GB of RAM—the entry model has 4GB—our particular unit has a whopping 1TB of space for storing RAW photo files (or games or movies), which is twice as much as we got last year. And there are other wonders as well, such as an improved four-speaker system that includes a woofer and tweeter in each speaker. The iPad has always sounded magnificent for what it is, and now it sounds divine. 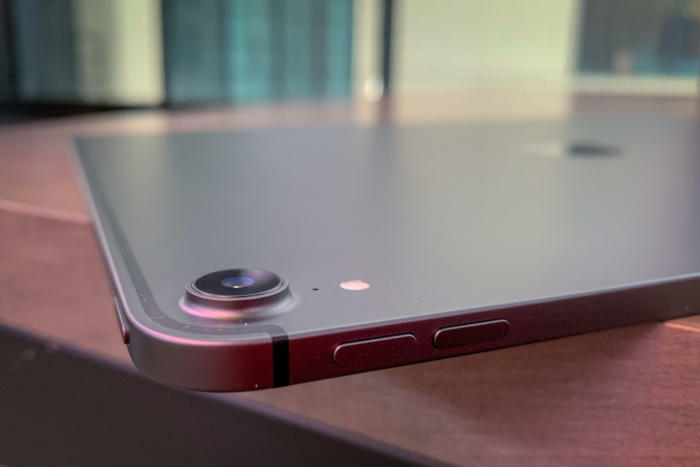 It’s also got a 12-megapixel camera and a f/1.8 lens on the back, although Apple sacrificed the optical image stabilization we loved in the previous models, presumably in an effort to make the iPad slimmer. Despite that effort, the camera now protrudes from the back much as the camera on the iPhone XS, although fortunately this doesn’t cause the tablet to wobble at all while writing longhand. I spy a little eye. 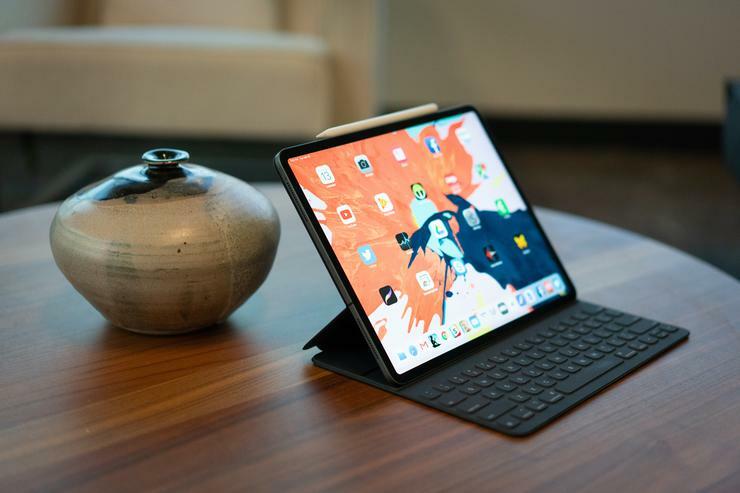 The 12.9-inch iPad starts at $999 with 64GB of storage, but the powerhouse I’m currently typing on costs $1,899 and that doesn’t even include the $199 Smart Folio Keyboard or the $129 2nd-gen Apple Pencil. That’s a “pro” price, and we should expect “pro” performance from it. Good thing, then, that the iPad Pro's A12X Bionic chip delivers it. 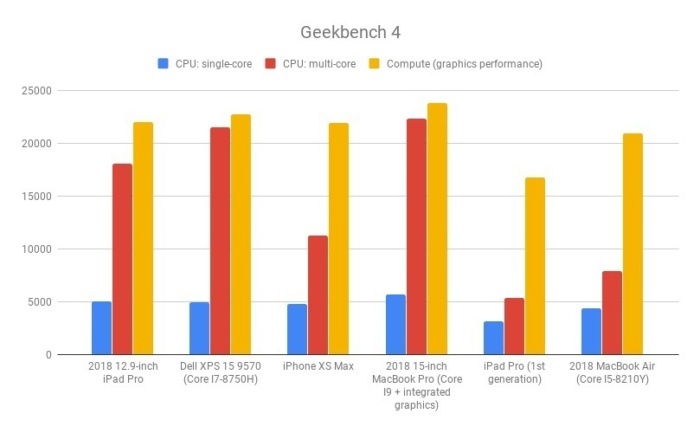 We were already impressed with the A12 Bionic in the iPhone XS and XR, and that chip “only” had a six-core CPU and a four-core GPU. This little beast is a bit of a show-off, with an eight-core CPU and a seven-core GPU, and all eight of the CPU’s cores can flare to life at once when needed. Apple claims this kind of power makes it more powerful than 92 percent of portable PCs sold last year, and we see some evidence of that in our benchmarks. When looking at this, keep in mind that comparing benchmarks across operating systems is a dicey business at best. 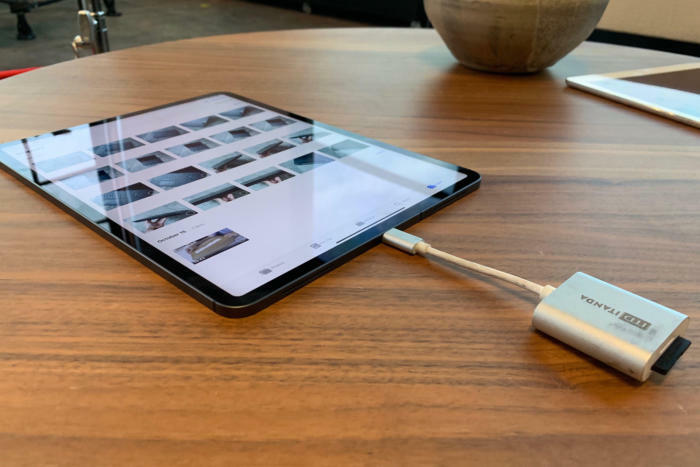 This kind of power would be impressive enough on its own, but it's especially impressive that Apple managed to wield it in a device that’s devoid of cooling fans and only slightly thicker than a drugstore clipboard. Even more remarkably, all this power has little impact on the battery life. Apple claims it can deliver around the same 10 hours of juice we saw in last year’s model, and that holds up in our tests. It holds up in the field, too: On an entire day without a charger—writing, playing games, watching a boring movie—the meter had only slipped to around 43 percent by twilight. Perhaps that’s because there aren’t many apps for the iPad Pro that can properly challenge it at a moment. It'll be interesting to see how it handles RAW files when Photoshop drops next year. As for games, Fortnite and Civilization VI already run well on the 9.7-inch iPad, and there wasn't much of a difference on the iPad Pro. Certainly the iPad Pro doesn’t currently support anything that approaches the power of the Xbox One S games that Apple compares it to. Whether we’re talking about games or productivity, we’re largely still waiting for developers to release apps that can push it to its limits. For its part, Apple is doing its part to pave the way for such apps by ditching the beloved Lightning port in favor of USB-C. That’ll be especially important once we start handling RAW image files in Photoshop, as the connection can handle data transfers of 10Gbps and mirror both video and data to an external 5K display. "Mirror" is the key word here, and one that limits the feature's usefulness. Perhaps in time we'll see more apps that let us use an external display as an extended display, but as it is we could only see what we were doing on the iPad itself. That may be useful for presentations, but not for work. It’s the same SD reader I use for my MacBook. In theory, USB-C 3.1 connectivity lets you hook up all kinds of things with it. For instance, I plugged in my MacBook Pro’s 87-watt charger and watched the iPad Pro's battery fill far faster than it will with the rinky-dink 18W changer that comes in the box. For that matter, it’s fun to have a new use for all the USB-C dongles I’ve amassed, such as one that connects to the office ethernet or one that reads SD cards directly. In time, hopefully, wider adoption of USB-C will eliminate the need for dongles—but only in time. Despite Apple’s eagerness, there still aren’t a lot of devices that support USB-C natively. Even when they do, it’s never clear which devices will work with the iPad Pro, so you’re always going to need to experiment. Most of the time, it’s merely annoying—as in the way the USB-C cable used to charge the iPad Pro doesn’t also let you hook up to an external display. You’ll have to buy another cable for that. In the case of external hard drives, though, it’s depressing. External storage drives don’t even work with the iPad Pro—or at least they merely ask if you want to import the photos on them to your Photo reel. Even then, you'll need to have the photos in a folder titled "DCIM" in order for them to show up. It’s frustrating, and it also suggests that you won’t be able to import images directly into Photoshop with a storage device if you so choose. That’s a bummer for anyone who assumed that the beastly device would finally allow them to set aside their MacBook Pro for creative work. If you’re using the iPad Pro for creative work, though, there’s a good chance you’re already familiar with those limitations. Accept it on its own terms, and you’ll find that some of the latest additions greatly improve the day-to-day experience. No interface improvement is quite so welcome as the switch from the home button to Face ID. The home button worked fine on the iPhone, but it was always awkward on the iPad. Whenever you wanted to unlock something, whenever you wanted to see every app, you had to reach and press your finger a button that was awkwardly placed no matter how you used it. I had doubts that Apple could pull off Face ID on the iPad when rumors first started dropping and we saw the hints of the coming feature when Apple introduced iPhone X-style gestures to the iPad. I was wrong to worry: It works beautifully. More remarkably, it uses the same 7-megapixel True Depth front-facing camera found on the iPhone XS (which means we also get Portrait mode on an iPad for the first time), but in this case there’s no notch. Even better, it works regardless the iPad Pro's orientation, and a little arrow helpfully pops up to show you where the sensor is if you’re blocking it. While we’re at it, the headphone jack is also gone, but it was similarly unsuited to the iPad. Headphone cords always get in the way, and that frustration led me to buy my first set of Bluetooth headphones. I believe the iPad Pro is better without it, but, in fairness, its removal is another example of Apple removing options that a “pro” crowd might expect.